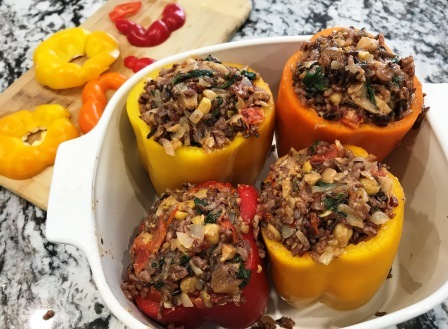 These stuffed peppers make a delicious main or side dish and you can use just about anything in the stuffing – a great way to use up bits and pieces of veggies and herbs in your fridge! You can also give them a unique international flair by adding spices to the filling while you are making it. 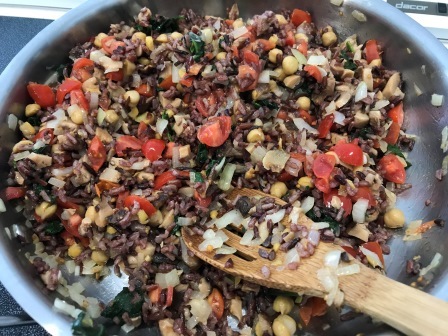 Add cumin and chili powder for a Mexican flavour, dried basil and oregano for a Mediterranean flavor, or curry powder for an Indian flavour, or …. whatever your taste buds are desiring! 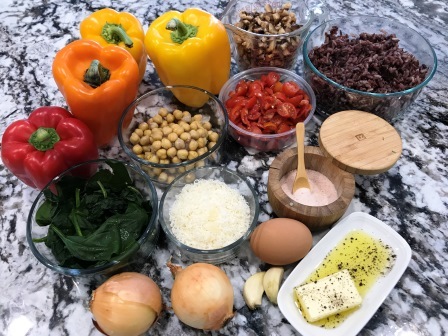 This recipe is vegetarian, but you can easily make it vegan (alternate vegan suggestions included in the ingredient list). Enjoy! Heat butter/oil in a skillet over medium heat. 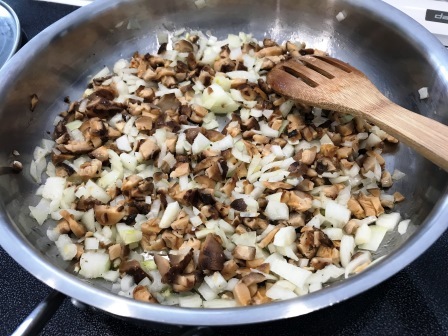 Add diced onions and mushrooms, salt, pepper, and any other spices or herbs you desire and cook until soft, about 3 to 4 minutes. Add all the other ingredients to the skillet except for the eggs and cheese. Mix well and saute for 2 to 3 minutes. Taste mixture and season to your satisfaction. Turn off heat, remove skillet from heat, and set aside to cool. Just as an aside, this filling is so good, you could serve it as is as a side dish! While the filling mixture is cooling in the skillet, cut around the top of the peppers – just enough so you can pull the stem and the attached seeds out. I cut up the flesh around the pulled off top and saved the pieces to add to a green salad I prepare to go with this dish. Arrange the peppers in a casserole that is just tall and wide enough to hold the peppers in an upright position. 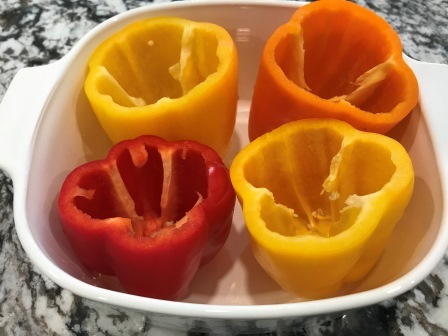 If you have any bell peppers that won’t ‘stand up’, you can always cut a tiny sliver off the bottom to level them out, but be careful not to cut a hole into the bottom as the stuffing will fall out! You can also cut the peppers open lengthwise if you’d rather serve them as ‘half-shells’. This is a great option if the peppers are on the large side and/or you want to serve them as a side dish rather than a main dish. Once the filling mixture is cooled, add the egg and 1/4 cup of the cheese into a bowl. Whisk together and stir into the filling. 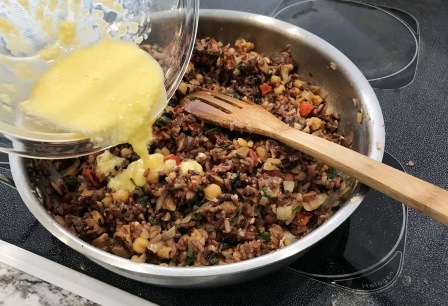 It is important that the filling is cooled before you do this step, otherwise you will get hunks of ‘scrambled eggs’ in your filling instead of having it evenly mixed in to act as a binder for the other ingredients in the filling. Step 5: Fill ‘Em Up! Spoon the filling into each pepper, pressing down gently to ensure they are well packed, and slightly mound the filling on top. 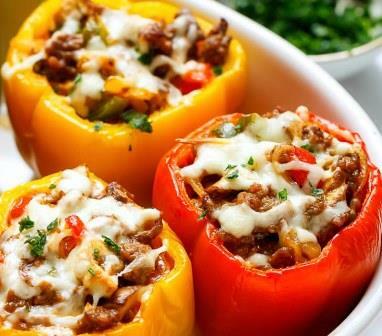 Add a few ounces of water to the casserole dish, cover (with the casserole dish lid if it fits without squishing down on the peppers – or you can put a tented piece of aluminum foil instead), and cook at 375F for 50 to 60 minutes or until peppers are cooked to your desired texture. If you want to have some melted cheese on the top, add the extra cheese during the last 5 minutes of cooking time, then broil for a minute or two for a golden, bubbly finish! 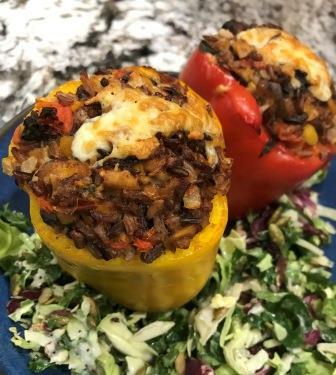 When I serve these stuffed peppers as a main dish, I typically serve them whole and with a side salad. One stuffed pepper per person is typically enough.